The adhesion problem regarding the first layer of printing model is well-known for those who work with FDM printers on a regular basis. The printing model warps on the building platform or separates in places. Oftentimes the printing model is no longer usable. A young start-up team called AprintaPro has recently launched a product to solve this problem. 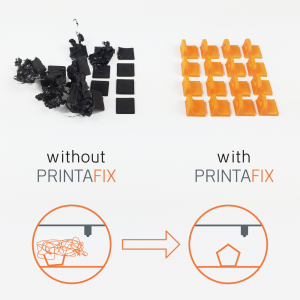 PrintaFix Basic is specifically designed for FDM / FFF 3D printing. It is distinguished by a simple application, a low cost per print object and excellent adhesion to unheated and heated printing beds. Simply shake, spray on the printing area and start printing. Warping has now become a thing of the past. PrintaFix Basic is the first product that meets all user expectations. The easy to apply spray is applied in a few seconds, offering excellent adhesion to the printing bed, is reusable, inexpensive, non-toxic and, when combined with warm water, it offers easy removal of the printing object. The instructions and a manual can be found here!